BKV Group partner and interior design director, Kelly Naylor, was recently quoted in an article in Multifamily Executive Magazine about the popularity of repurposing former industrial buildings in modern housing and mixed-use architecture. 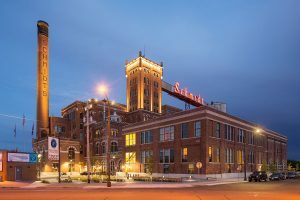 She spoke about choices she and the design team made in the creative reuse of the Schmidt Artist Lofts, formerly known as the Schmidt Brewery in St. Paul. BKV Group design team found creative ways to reuse and incorporate the building’s existing features. Some examples include a crenellated tower (a rectangular pattern along the top of a wall) and Gothic details. The scope of the renovation also included converting the brew house and bottling house into 247 loft-style units. The site also includes 13 townhomes with corbelled eaves (a piece of stone, wood, or metal jutting from a wall) and low-pitched roofs were also added to provide a total of 260 units. Click here to read more about the project.